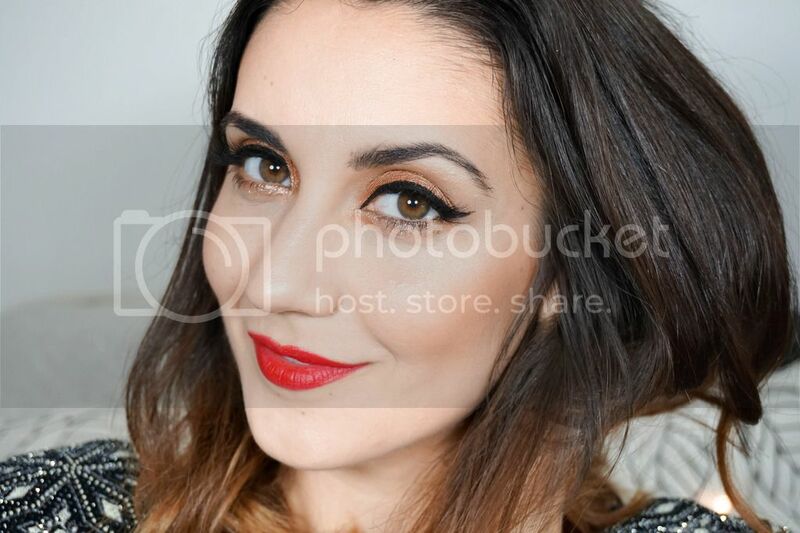 Beauty with charm. 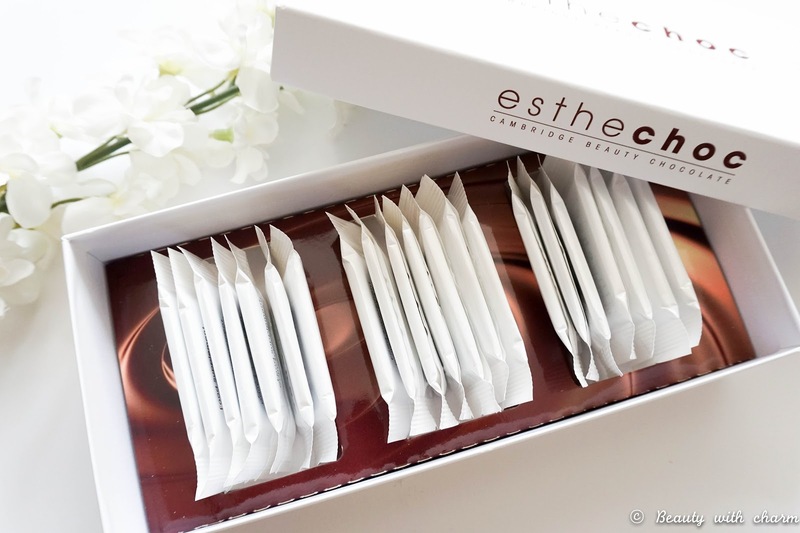 : Anti-ageing Beauty Chocolates? Anti-ageing beauty chocolate you say? I must be mad and to be truthfully honest I guess I am a little bit. 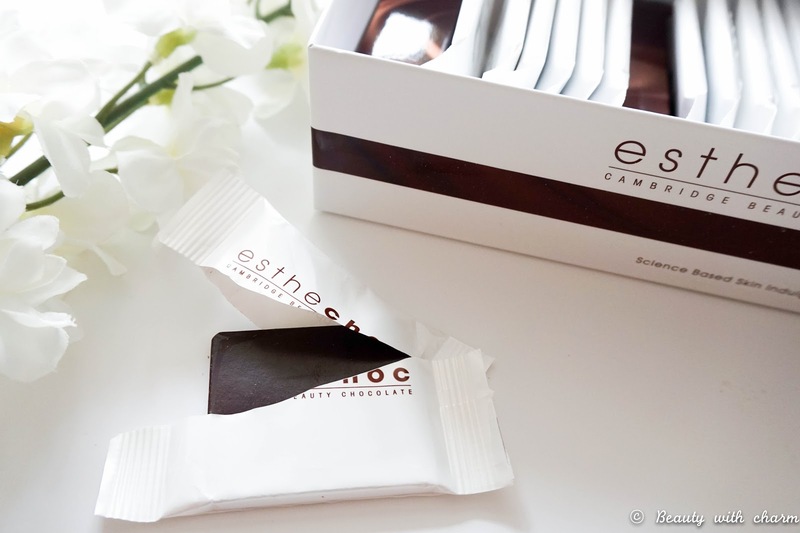 I was introduced to the brand Esthechoc Cambridge Beauty Chocolates* almost a month ago to try out the 3 weeks supply box and I was immediately intrigued. I love chocolate (on top of all other bad things) so to be able to indulge in a piece of dark chocolate each day in the name of beauty was definitely something I could get on board with. 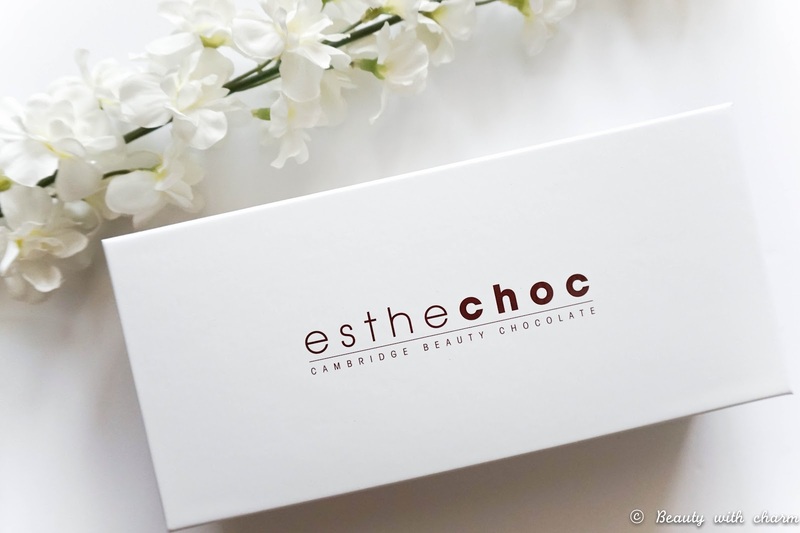 Esthechoc is exclusively sold in Harrods, so immediately you can tell that this is just one of those indulgent kind of products, because I know not everyone will be going out to buy a box for £35. The brand have scientifically proved their anti-ageing claims, where clinical data confirmed that the biomarkers & metabolic parameters of women in their 50's & 60's drastically changed after a 3 week trial to the same measures people in their 20's & 30's had. This is definitely impressive & it's good to know that it changes the skin from within, but I'm not so convinced that it could literally turn back time & erase wrinkles already accumulated by mature women. Dark chocolate has always been proved to be healthy if included moderately into our diets, because it contains strong anti-oxidants. However to get the full benefit of these antioxidants, you would have to eat a lot of chocolate which in turn wouldn't be healthy at all. The best thing about Esthechoc is that it provides those antioxidants in high levels but it's only a 38 calorie treat. It also tastes rather nice, if you're a fan of dark chocolate you are bound to love the rich taste. What you're all really asking though is do these chocolate work? Will they get rid of my wrinkles & smooth out my skin completely? In short they are not a miracle treatment, I mean the 10 years of scientific research is there, but nothing will ease wrinkles unless you go under the knife (you have to be conscious when buying luxury products like these). However all is not lost because these chocolates do what they claim to do…they nourish the skin from within. I didn't have wrinkles to begin with so my focus was never on smoothing out my skin. For me personally it was all about seeing an improvement in my circulation & blood flow, which in turn adds radiance to my complexion. After my 3 week trial my skin definitely looks & feels great, with a healthy glow from within. I haven't had concerns with dry patches & it feels plump so I can't say I'm disappointed.